The first malting of barley in Canterbury was around 1880 at the Canterbury Malting Company plant at Heathcote, Christchurch. The early members of the Michael family were among the first growers. All cultivation, sowing and harvesting was done with the help of a team of horses. No jumping on a tractor, turning on the switch, attaching headphones for accompanying music, and being snug in a warm tractor cab. First the horses had to be brought from the paddock, harnessed up and the plough, cultivator or other appropriate piece of machinery attached. After walking behind the horses all day, they then had to be brushed down, fed and all the harness taken off. No 9 to 5 jobs here, it would be from day break to dark and often beyond. In later years an army ‘great coat’ was a welcome addition to the wardrobe to help stave off the cold. The first tractor was purchased in 1949. A ‘bone shattering’ machine with no cab or modern soft seating. But life was still not easy as the area of land was small and contracting work had to be undertaken to help the budget. Cows were milked by hand to supply milk and cream to the city. In 1952 the small farm was sold and a larger property purchased further out. The first tractor drawn Massey 15 harvester was purchased with a five foot cutting width. All the grain was put into sacks that were hand sown with each sack weighing about 85 kg. At the end of the day all the sacks had to picked up from the paddock and stacked. No wonder all the farm boys were fit for rugby at the end of the summer. A larger property was purchased at Dunsandel and grass and barley were grown. 2000 ewes were lambed on the farm and as soon as possible after lambing the ground was cultivated to plant barley. The first irrigation we had was hard work and involved shifting by hand 30 foot lengths of pipe and rejoining the long line, twice a day. There were several of these lines to shift and it was not easy walking through waist high crops that were wet and cold. No socializing over the summer as it would often be 10 pm at night before everything was finished. Now irrigation is a lot more automatic although it does require daily moving and monitoring. 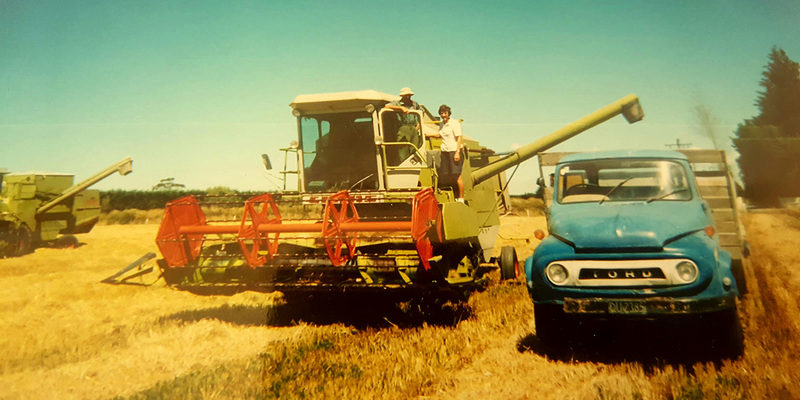 The price for barley was never really good enough to enable upgrading to high cost modern machinery which was why Doug Michael decided to add some value and purchased a disused malt plant and had a ‘go’ at making malt. He proved he could do it and moved the plant to the farm and rebuilt it with modern technology. The Canterbury earthquake was a setback but fortunately the building was undamaged and after a few days it was business as normal. The latest development has the most modern technology and is producing outstanding malt. With the addition of the roaster the freshest malts are always available in a huge variety of flavours to suit any discerning beer brewer and drinker.